[136 Pages Report] The hyperscale data center market size is expected to grow from USD 25.08 Billion in 2017 to USD 80.65 Billion by 2022, at a Compound Annual Growth Rate (CAGR) of 26.32%. Growing requirements for high application performance, growing needs for reduction in capital and operational expenditures, and increasing data center technology spending are the major growth drivers of the market. In this study, 2016 has been considered as the base year and 2017–2022 as the forecast period. Data centers in the recent years have become extremely powerful owing to the increasing computation as well as storage requirement to support high-end applications. There is a surge in the number of business-critical apps, which has resulted in increased data center complexities. Growing adoption of Web 2.0, e-commerce, social media, big data, cloud computing, online game hosting, and Hadoop is increasing the infrastructural requirements to increase application performance, energy efficiency, and server density. Traditional data centers, which were built on dedicated infrastructures for each workload including network switches, blade systems, and dedicated computing, are unable to support these deployments. Thus, the requirement for addition of intelligent and advanced data center technologies to cater to the growing data center performance requirement, coupled with the growth of strategic IT trends, is expected to increase the demand for hyperscale data center deployments. The hyperscale data center architecture enables organizations to add resources to their infrastructure for higher performance, capacity, and throughput, enabling high availability. These requirements arising from increased complexities are fueling the growth of the hyperscale data center market. The main objective of this report is to define, describe, and forecast the global hyperscale data center market on the basis of solutions, services, end-users, data center size, industries, and regions. The report provides detailed information regarding the major factors influencing the growth of the market (drivers, restraints, opportunities, and industry-specific challenges). The report aims to strategically analyze micromarkets with respect to individual growth trends, prospects, and contributions to the total market. The report attempts to forecast the market size with respect to the 5 main regions: North America, Europe, Asia Pacific (APAC), Middle East and Africa (MEA), and Latin America. The report strategically profiles the key players and comprehensively analyzes their core competencies. This report also tracks and analyzes competitive developments, such as joint ventures, mergers and acquisitions, new product developments, and Research and Development (R&D) activities in the hyperscale data center market. 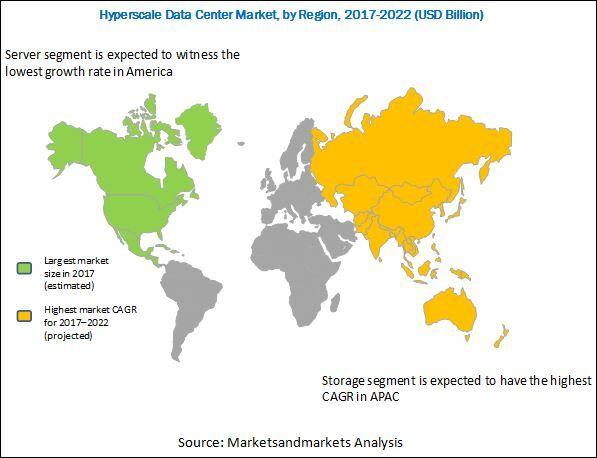 The hyperscale data center market ecosystem comprises vendors such as Dell Inc. (US), Hewlett Packard Enterprise Development LP (US), IBM Corporation (US), Huawei Technologies Co. Ltd. (China), Ericsson (Sweden), Cisco Systems, Inc. (US), NVIDIA Corporation (US), Lenovo Group Ltd. (China), Cavium (US), Quanta Computer Inc. (Taiwan), Broadcom Ltd. (US), and Intel Corporation(US). In December 2016, Dell EMC and VMware collaborated and launched VxRack SDDC Rack Scale Hyper-converged Systems, which is based on the Dell EMC PowerEdge platform and powered by the VMware Cloud Foundation. In March 2017, HPE announced that it has collaborated with BASF to provide HPE’s Apollo systems for supporting BASF chemical research. In November 2016, IBM announced the launch of the IBM Hyper-Scale Manager version 5.1 that provides a unified user management experience. Product matrix which gives a detailed comparison of product portfolio of each company. Further breakdown of the North American hyperscale data center market. Further breakdown of the European market. Further breakdown of the APAC market. Further breakdown of the MEA market. Further breakdown of the Latin American market. The hyperscale data center market is expected to grow from USD 25.08 Billion in 2017 to USD 80.65 Billion by 2022, at a Compound Annual Growth Rate (CAGR) of 26.32%. Data center operators face increased needs for scale-out data center architecture, which enables the scaling of critical data center components as and when the demand increases. Hyperscale data center solutions including server, storage, networking, and software components can be added to an existing data center infrastructure as individual nodes to enable a massively scalable architecture. These solutions are fueling the growth of the market as organizations are adopting them to cater to the increasing data center traffic. The report provides detailed insights into the global hyperscale data center market, which is segmented according to solutions, services, end-users, data center size, industries, and regions. In the solutions segment, server solutions are expected to dominate the market and contribute the largest market share, whereas, in the services segment, maintenance and support services are expected to grow at the highest CAGR during the forecast period. The end-user segment includes cloud providers, colocation providers, and enterprise users, where cloud providers are expected to have the highest market size due to increased demands for scalable infrastructure to support high-end cloud applications. The growing investments in data center technologies across the world and increasing number of data centers are further fueling the demand for hyperscale data center solutions and facilitating the growth of the hyperscale data center market. The BFSI industry is expected to experience a high growth, owing to the increasing number of banking applications, which has resulted in the exponential growth of data in the banking and financial services industry. Moreover, the BFSI sector is characterized by digitization and the increasing number of customers using various banking applications. Security of data is an area of concern for the BFSI industry, thus the well-equipped hyperscale data centers are generating demand from the BFSI sector. Additionally, BFSI handles thousands of virtual machines and physical servers, and has several monitoring tools and the need to deal with various challenges, such as optimizing resource allocation, reducing processing times, and maintaining data center uptimes on a daily basis. There are numerous transactions processed every minute and any disruption can cost billion dollar losses. The BFSI industry is therefore in need of an efficient scale-out infrastructure to meet the increasing customer demands, which can be easily met by commissioning the hyperscale data centers. The IT and telecom industry is one of the most evolving industries, in terms of technology and is in constant need for innovative technologies that help gain a competitive advantage over the other industries. The advancements in communication technology have had a positive effect on the IT and telecom industry, and have paved the way for high-reliability and computing solutions to handle and store data traffic originating from various data sources. This industry is characterized by the ever-increasing demand, which is accompanied by a sudden increase in the data center infrastructure and related resources. Data center vendors are deploying advanced scalable and secure solutions at lower costs to cater to the increasing demand from the IT and telecom industry. Hyperscale data centers are therefore being utilized in this industry, owing to their benefits in terms of scalability. The growing demand for effective hyperscale solutions is expected to cause a surge in the overall hyperscale data center market. High power computing systems are an integral part of the research and academics institutes, as these computers are essential to carry out the research. These high-performance computers are characterized by high compute density, which requires an efficient management. Moreover, these supercomputers also face the need for extended life of the equipment, with very few servicing downtimes. Hyperscale data center solutions provide the needed capacity requirements by provisioning the required scale-out infrastructure. Moreover, these data centers provide maximum performance with minimum downtimes. Research and academics institutes are seen widely adopting the hyperscale data center solutions owing to their significant benefits. The government and defense industry includes all the government organizations, agencies, and the defense sector as well. This industry has to deal with various security issues, such as safety, tax collection, public interest, and sensitive data. The increasing number of government initiatives in various developing countries have contributed to the rise in requirement for higher storage capacity and data usage. Initiatives in the developing countries in APAC, such as Digital India and Smart Cities, have contributed to the data usage. Additionally, the increasing requirement for information security and infrastructure availability has led to an increase in demand for efficient, scalable, and secure data centers. This increasing demand is easily met by deploying hyperscale data center solutions, owing to their scalability benefits. The hyperscale data center market is expected to gain traction in the government and defense industry, as it helps deliver high-performance through efficient commissioning of resources and delivering scale-out performances. What are the upcoming industry applications for hyperscale data centers? The report covers all the major aspects of the hyperscale data center market and provides an in-depth analysis of the regions of North America, Europe, Asia Pacific (APAC), Middle East and Africa (MEA), and Latin America. The market in North America is expected to hold the largest market share. Due to the presence of various developing countries and growing number of data centers, the APAC region is expected to witness numerous opportunities in the market. Increased infrastructural overheads may act as the restraining factor for the hyperscale data center market. Various vendors provide hyperscale data center solutions to help enterprises to reduce their capital and operational expenditures. HPE is one of the major vendors that offer hyperscale data center solutions with respect to computing, storage, networking, power, and cooling. The company is focused on developing data center solutions that can help to transform data centers in a cost-effective and secure way. Other vendors include Dell Inc. (US), IBM Corporation (US), Huawei Technologies Co. Ltd. (China), Ericsson (Sweden), Cisco Systems, Inc. (US), NVIDIA Corporation (US), Lenovo Group Ltd. (China), Cavium (US), Quanta Computer Inc. (Taiwan), Broadcom Ltd. (US), and Intel Corporation (US). These players have adopted various strategies such as new product launches, partnerships, collaborations, and expansions to remain competitive in the market. *Details on Overview, Company Scorecard, Product Offerings, Business Strategies, Recent Developments, and Key Relationships might not be captured in case of unlisted companies.